When a product is fine and has a small particle size, it is possible to inject air into the product so that it takes on a “fluid” state. Products that typically bridge and do not flow will flow virtually like water when fluidized. 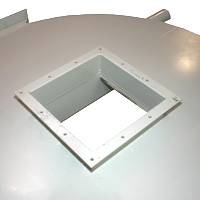 Kice air pad bin bottoms have been built for many years and are installed on storage tanks of all sizes. 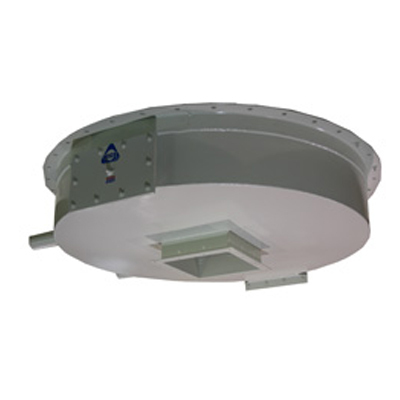 Fluidized bin bottoms have no moving parts and are not only safer than vibrating bin bottoms, they can enable a bin to be unloaded in a matter of minutes. Typically air pad bin bottoms are installed on the hoppers of bins that are suspended above a truck or rail loading area. 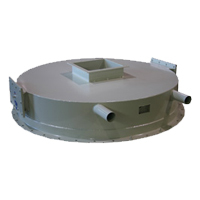 A Kice air power unit is used to provide fluidization air. Once the product is fluidized, the outlet is opened and product is ‘flood loaded’ into the truck or rail vessel. A 50,000 pound load of product can be emptied in roughly 3-5 minutes. These units are not suited for every product, so please contact Kice for information on your specific product. Materials of Construction are standard in mild steel. Stainless steel is available. 4-Ply Polyester Membrane allows air to be dispersed evenly through the product. Interior Surfaces include epoxy coated mild steel with stainless steel hold-downs for the polyester membrane. Discharge Transitions can mate with a variety of control valves including butterfly valves and slide gates. Access Doors allow for visual inspection of the fluidizing air chambers.